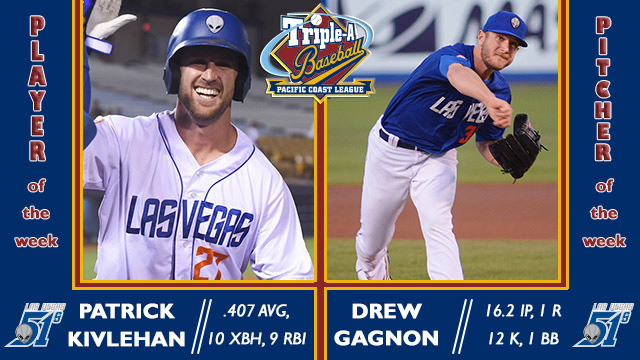 ROUND ROCK, Texas - Las Vegas 51s teammates Patrick Kivlehan (IF/OF) and Drew Gagnon (RHP) have been selected the Pacific Coast League's Player and Pitcher of the Week for the season-ending period of August 27-September 3, 2018, the League office announced. Kivlehan and Gagnon helped the 51s win seven of their final eight games to finish the season two games over the .500 mark. In eight games, Kivlehan topped all players in professional baseball (Minor and Major League players) with 10 extra-base hits and a 1.074 slugging percentage. His four home runs tied for the PCL-high, while his 29 total bases placed second; in each category, his teammate Peter Alonso , this week's runner-up, had totals that either tied (4 home runs) or passed (30 total bases) Kivlehan's marks. Kivlehan hit .407 (11-for-27), drove in nine runs, scored eight runs and walked (6) more than he struck out (5). He also posted the PCL's best OPS for the week (1.589). Kivlehan had hits in seven of the eight games. He provided the offense in a shutout win on August 28 against Tacoma, doubling, homering and driving in three. That began a stretch of three consecutive games with home runs, all against the Rainiers. In each of those contests, he also hit a double and scored at least one run. Kivlehan's final home run of the week was a two-run shot on September 2 against Sacramento. In the season finale, Kivlehan reached base a weekly-best four times, doubling and walking three times, in the 51s walk-off win. The product of Rutgers University is in his first year in the Mets organization after signing a Minor League deal in May. He has been with the 51s since and hit .314 (111-for-354) with 20 home runs and 67 RBI in 98 games. Kivlehan was hot to finish the season, batting .371 (36-for-97) with 13 home runs since the beginning of August. The seventh-year professional is with his fifth organization (Cincinnati, New York [NL], San Diego, Seattle and Texas). He was drafted by Seattle in 2012 and made his Major League debut with San Diego in 2016. This is his fourth career Player of the Week award, most recently winning with the Single-A California League's High Desert club in 2014. Over two starts, Gagnon allowed only one run in 16.2 innings, striking out 12 against just one walk. On August 28 versus Tacoma, Gagnon tossed the PCL's fifth nine-inning complete game shutout of the season, allowing two hits and a walk, but facing just one over the minimum, in a 97-pitch effort. He retired the final 14 hitters and struck out eight in the start. Gagnon then threw on September 2 against Sacramento and allowed one run on eight hits in 7.2 innings, striking out four. The 28-year-old did not factor in the decision of Las Vegas' late-inning win. Gagnon is the PCL's Pitcher of the Week for the second time in the last month. For the week of August 6-12, he made two starts and struck out 19 against two walks. The California native, in his first year in New York's organization, led the PCL in strikeouts (167) and innings pitched (157.2) while finishing second in WHIP (1.23). Gagnon sported the League's second-highest strikeouts-per-nine innings ratio (9.53) and fifth-lowest walks-per-nine innings ratio (2.40). Gagnon started the year with Double-A Binghamton and made one start for the Rumble Ponies before his promotion. His only other start this year was his Major League debut; Gagnon made a start against Philadelphia on July 10. Gagnon was drafted by Milwaukee and spent his first six years in that organization before spending 2017 in the Los Angeles Angels system. This is his fourth career Pitcher of the Week honor.